Even after a movie adaptation that raked in $349.8 million, Angry Birds doesn’t seem to have as strong a presence that it once had. Having become bored with the same old food, it had seen the greedy King Pig order his minion pigs to steal eggs from the multi-coloured birds on Piggy Island, soon setting out to recover them by flinging themselves at their adversaries in a slingshot. Downloaded more than 12 million times on the App Store alone, it wasn’t surprising to see imitators soon surface. King Oddball is one such game. Blow up tanks! Collapse structures! Crash helicopters! Squash puny humans! Hurl boulders until nothing remains! END THE WORLD! King Oddball lends a glimpse at humanity on the brink of extinction, something I’m sure that many would argue we have come to fear in the real-world at this point in time. What you probably wouldn’t have expected, is that our destruction is caused by a levitating circular creature adorned with a crown that swings boulders back and forth with his tongue. 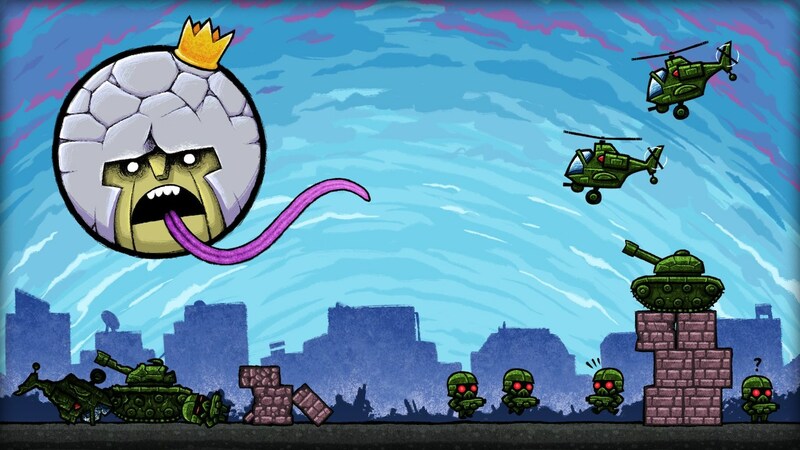 With origins on mobile five or so years ago, King Oddball, as with the rest of the games that developer 10tons has released on the Nintendo eShop so far, makes a clean transition across to Nintendo Switch. And while comparisons can unquestionably be drawn with Rovio Entertainment’s creation, it brandishes enough quirk to be able to stand apart. Against a sensationally jazz-infused soundtrack from composer Jonathan Greer and performed by the Austin Piazzolla Quintet, there is a simplicity in approach that can soon see addiction set in. Charged with ending the world, you must use the boulders that stick to the King’s tongue to destroy all enemies that have been sent to repel you in the 120 or so levels that the game presents. Given three boulders that each has the chance to ricochet off their targets, the player is free to slam them into explosive crates, throw them straight at enemies, or use them to topple towering structures in the hope that you will crush nearby tanks and helicopters. That soon makes King Oddball become all about perfecting your timing – the player learning precisely when to release the boulder to cause as much devastation as they possibly can, with it rolling and bouncing around in reaction to whatever it slams into. Constantly swung backwards and forwards, a simple button press (or tap of the touchscreen in Handheld mode) releases it at the moment of your choosing for you to then sit back and watch whatever carnage unfolds. If you don’t mercilessly destroy the opposing forces with the three boulders that you have, then you will have to restart that particular level. You can recover a boulder if it rebounds straight back at the King, or if you crush three or more enemies with a single boulder. These levels are arranged on a map-like grid, with the player eliminating their enemies in a particular section before being presented with the chance to move on to the next. Keen to go to some lengths to differentiate the experience before it descends into a monotonous cycle, the developer throws in levels with particular twists. That can come in The Boom Challenge, where the player uses grenades instead of boulders to blast away obstacles to expose and eradicate their enemies, or the Hall of Diamonds, where you must destroy foes with fewer boulders before you have to chuck away a diamond that you have somehow unearthed. With the Secret Moustache World to eventually discover, King Oddball certainly isn’t short on content for its low price point, even if it largely continues to retread the same idea for its apocalyptic duration. There are achievements, carried over from the mobile release, that can help to spur your destruction ever onwards, for those that need some encouragement. King Oddball readily entertains with its quirky demeanour, putting an entirely unexpected body part to work to unleash wanton destruction upon the world. It may have riffed on someone else’s concocted formula (and with less breadth at that) but, especially for those longing for an alternative to Angry Birds on Nintendo Switch, it’s hard not to come to appreciate the game’s warped nature.